At the moment the demon Mara attacked the Buddha and nearly derailed his path to enlightenment at Bodh Gaya, the Buddha lamented that he could turn to no one for refuge. Not a soul in the present world could vouch for the selfless actions he had performed in his previous lives and thereby reward him by defeating Mara. Suddenly, however, an earth goddess sprang from the ground and declared that she had witnessed his boundless charity during his last life as Prince Vessantara. The earth then “resounded with . . . a hundred thousand echoes [earthquakes? ]” and Mara and his troops were thrown into disarray, as a Pali text from nearly two thousand years ago informs us (Jayawickrama 1990, 98). The Buddha’s former lives were encapsulated in “birth stories,” known as jatakas (Pali and Sanskrit). The tales number in the hundreds, with the jataka centered on the life of Prince Vessantara ending the series. Underpinning the jatakas is the notion of karma—that is, virtuous actions are always rewarded while negative actions never escape horrible consequences. Without the final past life of the Buddha to inspire the earth goddess, Mara would have been left to triumph and Buddhism would never have been born. Buddhism therefore owes an incalculable debt to the jatakas. A simple definition of a jataka is elusive, but it is essentially a story told by the Buddha about one or another of his previous lives, before he became a fully enlightened one, or Buddha. In these former lives, he is referred to as a bodhisatta (Pali), usually rendered as “Buddha-to-be.” His births assumed diverse forms: in some tales, he appears as a king, a hermit, or a village potter, while in others he is an animal, such as an elephant, a horse, or a rabbit. The Buddha’s telling of the story is prompted by an incident taking place in the present, and is often associated with his disciples in one of the famous Indian monastic centers, such as Savatthi or Jetavana. 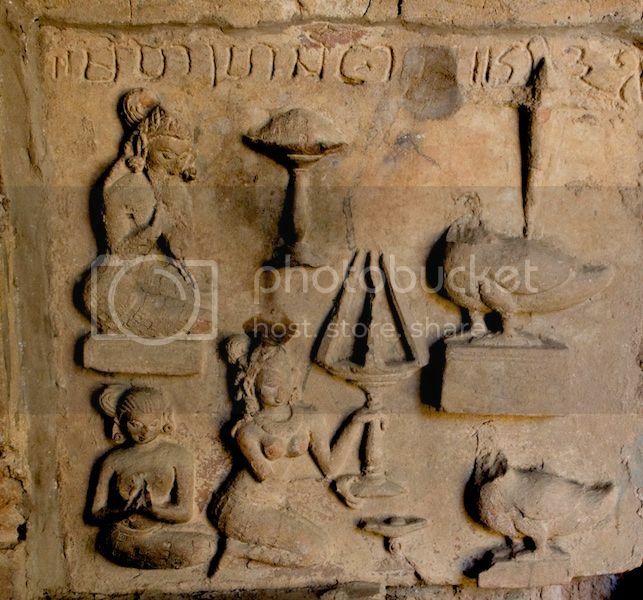 This “tale of the present,” or paccupanna-vatthu (Pali), sets the stage for the story from a past life, or atita-vatthu (Pali), and in many jatakas is related to it thematically while in others the connection is unclear. For example, the preamble of the Vessantara Jataka speaks of two miracles that the Buddha effected in order to win over his kinsmen; this has no apparent connection to the central theme of this jataka, which is generosity. Also, the stories always conclude by identifying the story’s principal protagonists. Thus, the noble prince Vessantara is revealed to be none other than the Buddha in a past life, while the tale’s villain, a Brahmin named Jujaka, is Devadatta, the Buddha’s wicked cousin, in a previous existence. The plots of many jatakas are simple and are reminiscent of Aesop, La Fontaine, or India’s famous Panchatantra. One tale, for instance, features a self-sacrificing monkey-king who saved his monkey troop from the archers of a local king (Jataka 407). Another centers on a hare who was prepared to leap upon a fire in order to feed a starving beggar; the beggar was in reality the god Sakka, and the rabbit’s willingness to sacrifice itself was a test (Jataka 316). Sakka, to ensure that the world would never forget this noble act, “daubed the sign of the hare on the orb of the moon” (Cowell 1897, III:37). One popular tale begins with the wife of a prince ditching her husband for a paraplegic thief whom she carries in a basket on her head! (Jataka 193). These tales of monkeys, rabbits, and feckless wives clearly shed little light on the rarefied abstractions of Buddhist philosophy. No wonder that these stories have been dismissed as “folk tales” and largely neglected in Buddhist scholarship. However, it is these very stories that have shaped the basic beliefs of the majority of Buddhists, both ancient and modern. Indeed, reflecting on the impact of these Buddhist stories that permeated her childhood in Sri Lanka, Ranjini Obeyesekere concludes, “That was how we learned to be Buddhists” (Obeyesekere 1991, x). In the same way, the homilies surrounding Christ and his disciples and the parables are certainly more influential than the lofty treatises of Thomas Aquinas or Paul Tillich and countless Western theologians. The second publication, co-authored by Appleton and Sarah Shaw, a member of the Faculty of Oriental Studies at the University of Oxford, is a translation of the last ten jatakas, issued in a handsome two-volume box set. All 547 tales were translated into English long ago by a handful of scholars under the editorship of E. B. Cowell. That edition, brought out between 1895 and 1907, runs into six volumes and is based on the jataka collection associated with Sri Lanka. Its Victorian English, peppered with archaic expressions and interminable sentences, is tough going for modern readers. Happily, this new rendition is fresh and spontaneous, while its style and vocabulary have not been dumbed down. Also, readers can be assured that this new translation is faithful to the original, in view of the translators’ comfortable familiarity with Pali. An added bonus is the foreword contributed by Peter Skilling of the French School of Asian Studies (EFEO), Bangkok, which discusses the earliest biographies of the Buddha. He also treats the early artistic depictions of jatakas in India, such as at Bharhut. Among the most famous in early Indian art is an episode from the Vessantara Jataka on the Eastern Gateway at Sanchi. 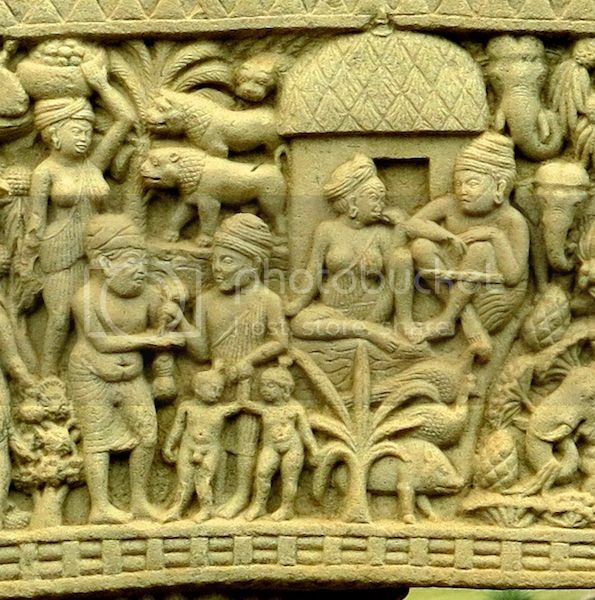 Prince Vessantara presenting his children to the wicked Jujaka (Jataka 547), East Gateway, Sanchi, India. Circa 1st century BCE–c. 1st century CE, sandstone. Why these ten tales gained such a prominent position is still an open question. The authors point out that many of the major protagonists belong to royal families, an ever popular theme. Also, women’s roles in the last ten jatakas are generally positive, unlike many tales in which women are temptresses if not conniving manipulators. In addition, the racy or ribald elements found in a number of jatakas as well are absent in the last ten, thus making the set more agreeable to wider audiences. It is difficult to pinpoint the exact moment when the last ten stories were selected as a group for depiction. Perhaps the earliest extant examples are “boundary stone” sculptures and terracotta tiles in 11th century Thaton, the old Mon center in Lower Myanmar. The sequence of these tiles matches the ordering of jatakas found generally among the later art of Pagan and Southeast Asia, thereby suggesting that this sequence, which differs slightly from the Sri Lankan, originated among the Mon. Despite the special veneration for these last ten tales, artists often rejected them in favor of jatakas that were evidently more popular. Notable examples are among the murals of Tivanka Temple, Polonnuruva, Sri Lanka and among some prominent temples at Pagan, such as the Nagayon. More recent examples are the 19th century murals at the Kelaniya Viharaya near Colombo, where only two among a total of seven jatakas are drawn from the last ten. Such evidence suggests that local taste easily overrode the special position of the last ten tales. A few of the last ten jatakas are found now and then in the popular art of 20th century Myanmar, but other tales are far more frequent. For example, one very popular jataka represented at pagodas in Myanmar describes the bodhisatta's interpretation of King Kosala’s 16 dreams (Jataka 77). One dream centers on a rope-maker whose rope is secretly being eaten by a jackal; this is likened to a shameless and licentious wife who gambles away her husband’s hard-earned money. Another popular modern tale in Myanmar is the sorry tale of five young brothers on a road trip who are ensnared by lovely maidens representing forms of sensual pleasure; the maidens soon revert to ogresses and all of the youths perish (Jataka 96). These tales are far more spicy and racy than the last ten, which verge on the sentimental. However, modern religious art in Thailand, Laos, and Cambodia shows a marked preference for the latter. Each tale in this publication is preceded by an insightful analysis that sets the story within the context of the jatakas and wider Buddhist thought. The value of these introductions to each jataka cannot be overstated. Over 50 color photographs illustrate various episodes from the last ten jatakas. The earliest are a series of tiles from the roof terraces of Ananda Temple at Pagan in Myanmar, circa 1100, while the others are mostly mural paintings in Myanmar and Thailand from the 18th to 20th century. A handy glossary precedes an extensive bibliography, while the index allows the reader to quickly locate the many personal names distributed throughout the ten tales. This two-volume box set is certainly another feather in the cap for Silkworm Books in Chiang Mai. The two publications reviewed here complement one another, and together offer a wealth of information and analysis that will greatly appeal to general readers and specialists alike. Jataka Stories in Theravada Buddhism: Narrating the Bodhisatta Path, by Naomi Appleton, was published by Ashgate Publishing Limited, Farnham, Surrey and Burlington, Vermont, in 2010. The Ten Great Birth Stories of the Buddha: The Mahanipata of the Jatakatthavannana, translated by Naomi Appleton and Sarah Shaw, was published by Silkworm Books, Chiang Mai, in 2015. Cowell, E. B., ed. 1895-1907. The Jatakas, or Stories of the Buddha’s Former Births. 6 vols. Cambridge: Cambridge University Press. Jayawickrama, N. A. 1990. The Story of Gotama Buddha. Oxford: The Pali Text Society. Obeyesekere, Ranjini. 1991. Jewels of the Doctrine: Stories of the Saddharma Ratnavaliya. Albany: State University of New York Press.